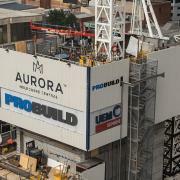 Aurora Melbourne Central on La Trobe Street will be the tallest residential tower in Melbourne's CBD. It will also be the only residential complex to have its own direct access to the underground City Loop rail station. The residential tower, expressing luxury and elegance in its every detail, will have 92 floors and stand more than 271 metres tall from the footpath. Architects Elenberg Fraser designed the Aurora Melbourne Central for Malaysian based developer, UEM Sunrise. 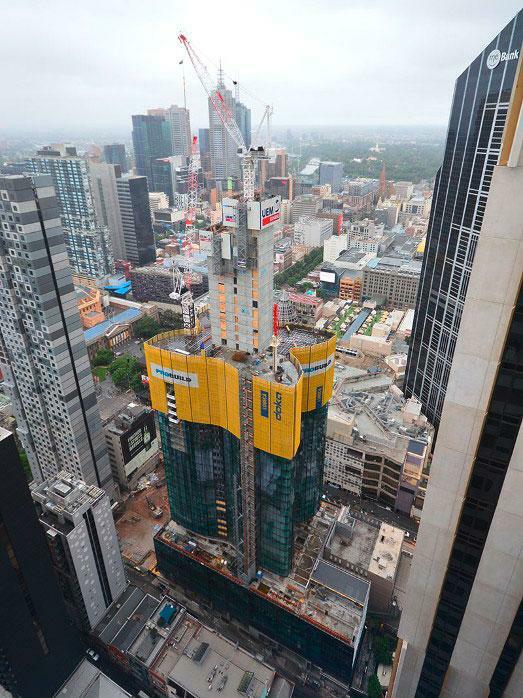 For this out-of-the-ordinary project, Tier-1 Australian contractor Probuild, one of Australia’s largest construction companies, selected Doka and Lubeca as suppliers of key elements of the formwork solution. When completed in late 2019, the highrise will accommodate 959 residential units and 252 serviced apartments, plus commercial office and retail spaces. 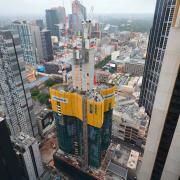 Formwork know-how from Doka and Australian Doka subsidiary Lubeca is helping to ensure rapid progress on the build. The buildings core is being built with two separate platform systems, and this speeds up the cycle times. 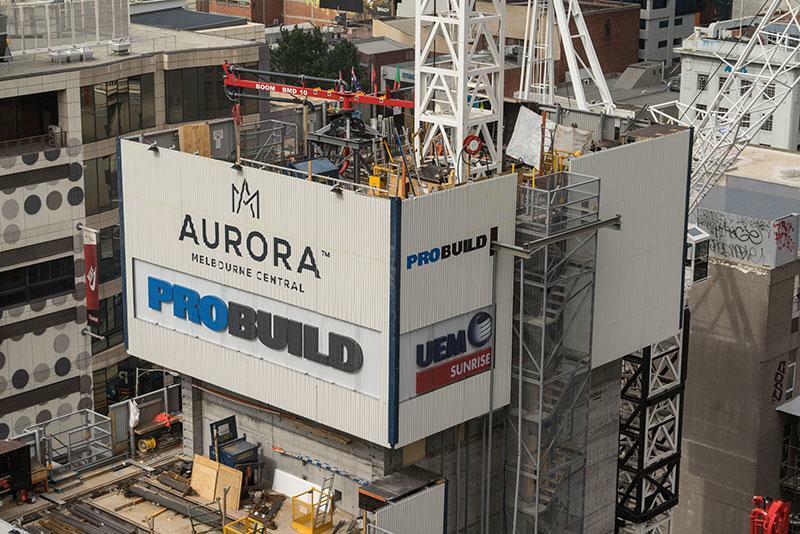 Consequently, the Aurora Melbourne Central build is rising in the steady rhythm of a four-day cycle. 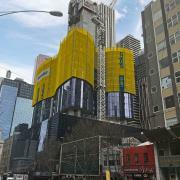 The project ranks as Doka Australia's biggest single contract to date. As well as being one of the tallest buildings in Melbourne, with its unique curves and fascinating glass façade complete with vertical fins and integrated LED lighting, the Aurora tower will be an architectural highlight on the city's skyline. Seen from above the building looks like a butterfly. From the 68th floor upward it transitions into a heart shape. Alexei Simm, Project Director at Probuild said that even with the unique geometry and non-typical elements, record levels of daily curtain-wall panel installation had been achieved to date, due to the integration of lifting structures into the Doka screen design. 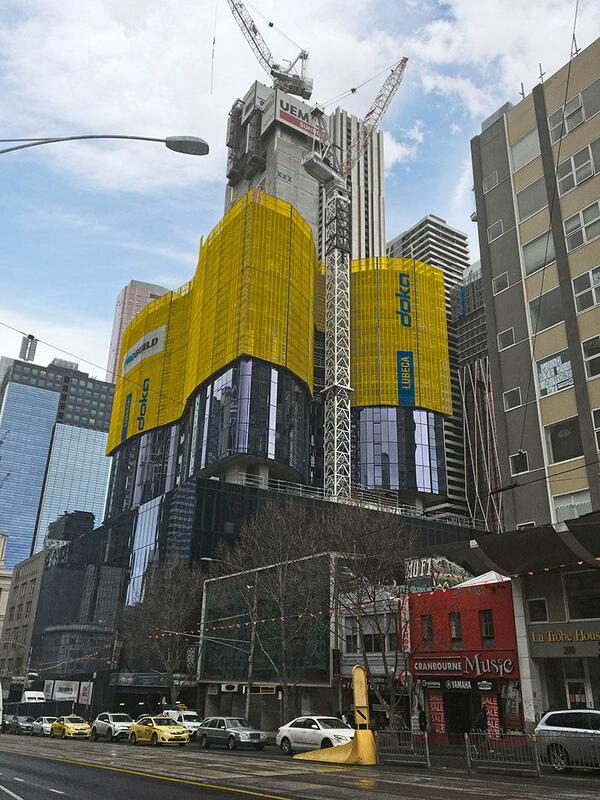 Working in close cooperation with Doka Australia, the highrise experts at headquarters in Amstetten developed an innovative façade screen solution for the Aurora Melbourne Central build. "As well as being totally unique, the Aurora build is also in many ways a trailblazer project. It's a very long way from Amstetten to Melbourne, but even so more than 90 % of the material, that's 4100 m² of formwork, was delivered to site on time. This is the first time that a Doka protection screen 24 metres in height has been used, and it has proved to be a superb solution", asserts Richard Wimmer, Project Manager in the Global Expertise Center Highrise. The Protection screen Xclimb 60 enables construction work to be carried out on the top building levels of highrise projects in great safety, and protected from the weather. "The façade panels are installed from inside of the building. So the workers are in a fully enclosed environment without risk from working with slab edges and without adverse weather affecting progress. That's a quantum leap forward in improving safety and the direct result of Doka's innovative drive", emphasizes Christian Unger, Managing Director Doka Australia, summing up benefits of the façade screen solution. Xclimb 60 is a hydraulically climbed system that can also be lifted quickly by crane when crane capacity is available. It is continuously structure-guided, so it can be operated even at high wind speeds. In combination with an integrated monorail system it makes the façade panels safer and faster to install, which also helps save costs. Thank you for your interest - A butterfly rising elegantly skyward. Thank you very much for your interest - A butterfly rising elegantly skyward.